Give to the SDSU Art Council Ambassadors Student Scholarship Endowment Fund in one of the suggested amounts below or an amount of your choice. The Campanile Foundation – Art Council Ambassadors Scholarship Endowment Fund. 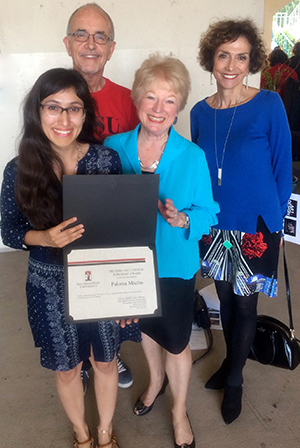 For nearly four decades, the SDSU Art Council has provided support to aspiring artists in the School of Art + Design. The Student Scholarship Endowment Fund was established in 2001 to award scholarships to exceptionally talented undergraduate and graduate students of the School. Your donation will enable us to provide more students with the opportunity and encouragement to move forward, take creative risks, and follow their chosen paths as artists, art educators, innovators and entrepreneurs. While providing a number of exciting and valuable benefits to you, your membership fee goes directly to support the students, faculty, programs and creative initiatives of the School of Art + Design at SDSU. Your contribution today will provide important and meaningful aid in the form of scholarships and awards to exceptionally talented students and faculty. Your donations will continue to create opportunities to young artists and encourage them to propel their creative careers forward. Please consider making a separate gift to the Student Scholarship Endowment Fund.